Sharp’s Full-HD 60” Class (60.1” diagonal) PN-C603D AQUOS BOARD® interactive display system lets you display a variety of information with ease and precision. Whether you’re in a classroom or meeting room, Sharp Pen™ Software opens up new possibilities for brainstorming and sharing information in real time. Flexible and cost-effective, the PN-C603D display provides a platform to boost collaboration and enhance the impact of your lessons, meetings, or presentations. 60" Class (60 - 1/16" Diagonal) Screen Size – Combined with Sharp UV2A photo alignment technology, help create brilliant color images with maximum size and impact. 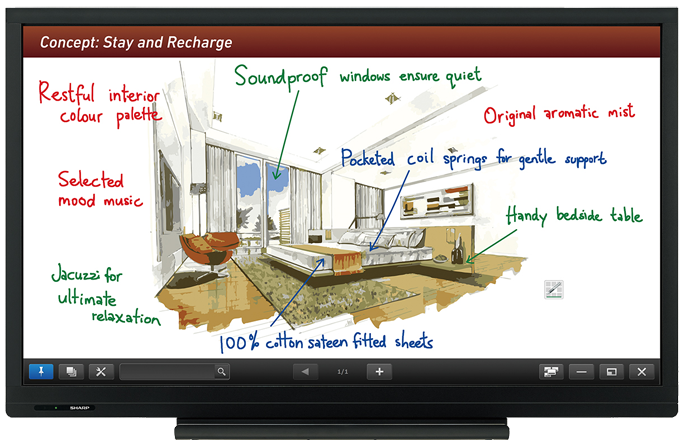 6 Point Multi-Touch/Multi-User System – Recognizing up to 6 points of contact, the PN-L603D allows up to two people to write on the screen at the same time using touch pens or fingers. *Analog PC, video, and component video are switchable (on bottom interface); use the menu to select. Video and component video connections require conversion cable via mini D-sub 15-pin jack.